Before human beings gave importance to sitting still and staring at a fire, it is likely that they found their most meaningful inspirations and links to the unspeakable and unthinkable through spirited movement. 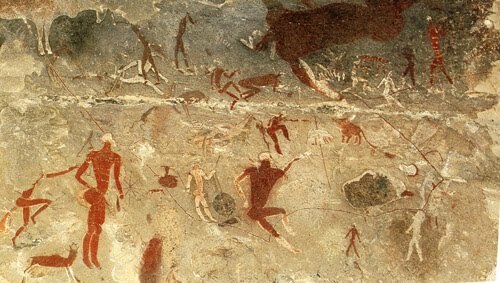 The ancient rock art of southern Africa, and the ongoing healing dances of Ju/’hoan Bushmen (or San) give us a clue about the origin of dancing spiritualities and how they moved lives. From the cradle of Africa, movement and dance spread around the world, and were central to the earliest forms of shamanism and religion. At last we come full circle, reuniting word and logos with body flight and ineffable communion. With this journal, Dance, Movement & Spiritualities, the relationship of dance and movement to diverse spiritualities is recognized and given appropriate academic respect. We have spent many years dancing, healing and doing research with the Kalahari Bushmen. They, among others, have long distrusted the ways in which disembodied ideas, words and talk can lead the mind astray, and dull the callings of the heart and soul; they have cultivated and elaborated another form of dictionary. As the linguists who created the first dictionary of the /Xam Bushmen, Wilhelm Bleek and Lucy Lloyd (1911: 331) learned from their first Bushman teacher, //Kabbo, ‘the Bushman letters are in their bodies’ and these letters ‘make their bodies move’. They meant by this that their relations with the seen and unseen worlds are experienced and identified as body tappings and movements. Furthermore, this body-knowing is awakened and strengthened by dances inspired by spirituality. The opposite is true as well: spirituality, as they know it, is inspired by dances moved by the longings of their hearts. From the perspective of the earliest moving and healing ways, spirituality without dance has little to nothing to say. For the Bushmen, all healers are dancers. They find the source of healing and wellness in healing movements that diminish talk and inspire song. Their world is a dancing world that holds a change-oriented spirituality. We are sure they would celebrate and even hold a dance for the arrival of this unique journal. When bodies express the felt realization of moving spiritualities, they enable revitalized words to speak with a different voice. When ‘dance’ and ‘movement’ are the first words of a journal’s title, we follow an old wisdom tradition that suggests that what we have to say must first be moved by spirited dance. 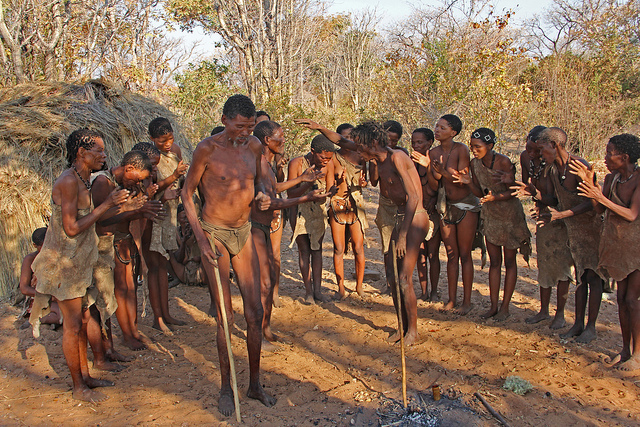 When Bushmen forget to dance, they get sick and believe that an enthusiastic dance is required for healing. Perhaps the same is true of academia: without dance and movement it gets sick, perhaps losing its soul and all meaningful relationship to how spiritualities inspire music, poetry, theatre, visual expression and dance (to name but a few categories of aesthetic practice). Dare we say that this journal is a medicine, an antidote to the soul-less kinds of discourse that have deadened academic inquiry? Or should we be quiet about such matters, trusting that the reintroduction and primacy of dance and its relationship to embodied spiritualities is enough to heal and transform? We leave these questions to our future readers and contributors, recognizing that the dance between reading and writing itself can mirror the movements that have awakened hearts to soar into the mysteries that surpass all understanding. To read more of this issue, click here. Tags: Africa, dance, new journal, spiritual. Bookmark the permalink. Dance equals Trance. It clears the mind and lets my body and the universe flow through. The ‘me’ disappears… It is love of the universe without any analysis and is full of beautiful life.